Professor Shawn Hitchcock (center) works in his research laboratory with students Stephanie Waggoner and Eric Jacobsen. Imagine pursuing an undergraduate and an advanced degree in chemistry—not the easiest of majors—while having to raise your two teenage children alone because your husband is serving in the military in Iraq. That was Cassie Goodman’s life a few years ago. Naturally, she struggled to balance the demands of school and family life under those circumstances. Goodman said she would have never graduated from Illinois State University without the encouragement she received from Chemistry Professor Shawn Hitchcock. He put her under his wing and gave her extra guidance during the four years she spent in his research laboratory. She is one of the dozens of students Hitchcock has mentored since he arrived at Illinois State in 1998. 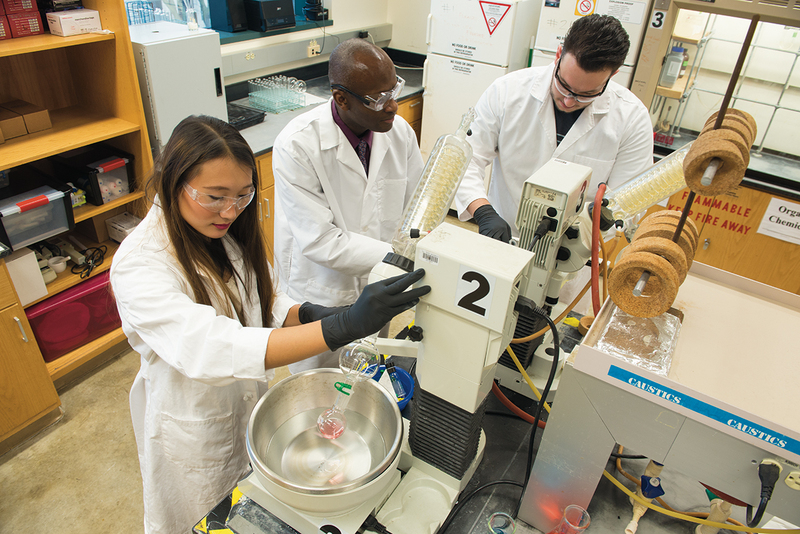 It’s in his lab where he builds on what the students learned in their organic chemistry courses and prepares them for careers in medicine, the chemical industry, or basic research. Hitchcock has successfully merged his research with his passion for teaching at Illinois State. In 2010 Hitchcock received the College of Arts and Sciences Outstanding College Researcher and a mentorship award from the Red Tassel Mortar Board. He has secured research funding from the American Chemical Society’s Petroleum Research Fund and the National Science Foundation, and travel grants for his students. Hitchcock also has been active with the Louis Stokes Alliance for Minority Participation. This program helps students from underrepresented backgrounds who want to pursue science, technology, engineering, or mathematics careers. Teaching has been part of Hitchcock’s life since he was a child growing up in inner city Detroit. During the summers, he would lead impromptu classes for his three younger siblings. “I always had that teaching bug,” he said. Hitchcock’s lab is a sort of friendly boot camp for aspiring chemists: The bespectacled scientist punctuates his sentences with an enthusiastic “Yes, sir,” has the haircut of a drill sergeant, and takes special pride in how clean he maintains his laboratory, located in a quiet corner of the Science Laboratory Building’s third floor. That’s not to say he is uptight—a familial atmosphere pervades the lab, and Star Trek drawings and a Simpsons poster about lab safety hang from the walls. One Monday afternoon last fall, three of his students—two undergraduates from Illinois and a master’s student from Bangladesh—joked and arranged social engagements in the lab as they conducted experiments and worked with machines with names like rotovap (the colloquial term for the rotary evaporator, a device for drying compounds). They described Hitchcock as a professor who cares more about his students than simply publishing his scholarly work. He even emails his own newsletter to students every few weeks to tell them about job openings. The laboratory’s goal has remained the same throughout Hitchcock’s tenure: to research methods to synthesize pharmaceutical drugs. Professor Shawn Hitchcock’s students are exploring more efficient and cheaper methods to make pharmaceutical drugs in his laboratory. The researchers focus on an area of chemistry called molecular asymmetry, or more specifically, molecular chirality. The basic idea is that molecules—amino acids, carbohydrates, proteins—have defined shapes. Some molecules exist as left-handed versions or right-handed versions, like a pair of gloves, Hitchcock said. When we ingest a substance that has shape properties associated with it, our bodies can recognize differences between the two different shapes. For example, the anti-inflammatory drug ibuprofen exists as an equal mixture of right-handed and left-handed forms, Hitchcock said. It is the left-handed form, however, that our bodies primarily recognize and use to alleviate pain. One extreme example of this phenomenon is the case of thalidomide. One form within in the drug caused widespread birth defects in humans in the 1950s. This contributed to the U.S. Food and Drug Administration acquiring the power to require proof of the safety and efficacy of new drugs, Hitchcock said. Hithcock’s lab attempts to use what are called asymmetrical templates to create refined and improved ways to make right-handed molecules versus left-handed molecules of several different drugs. In one case, former student Jonathan Groeper ’05, M.S. ’07, created a much cheaper method for making the decongestant pseudoephedrine. Another, David Casper ’01, M.S. ’03, paved the way for much of the early success in the lab through his contributions. His mentees have pushed Hitchcock out of his comfort zone. For example, Michael Squire ’01, M.S. ’03, who went on to work for British pharmaceutical giant GlaxoSmithKline, helped develop a successful template while working on an HIV protease inhibitor. He was able to persuade Hitchcock—normally a conservative thinker in terms of research projects—to go down paths he usually avoids. “Working with the students, convinced me to step out. You don’t always need to be on the same track and doing the same thing,” Hitchcock said. “(Squire) proposed modifying the project in a way that I thought was going to be disastrous. He was so passionate about pursing an alternate route, I thought there was potential this could work, not a high potential, but a potential. Hitchcock works hard to find students like these. They undergo a rigorous three-step interview process to gain acceptance into his lab. First, they tell him what they hope to learn. He, in turn, tells them his expectations and about his research. At last, they decide whether their ideas and goals will mesh. The objective is to select lab students who will conduct interesting research while building the confidence and skills necessary to do chemistry in the real world. With Hitchcock’s support, Goodman landed a job as a research chemist at the National Institute of Standards and Technology in Maryland. She learned about the position at a national laboratory science meeting called Pittcon. Goodman’s hard work in the lab had paid off. “He taught me what it is to be a good investigative scientist,” Goodman said.